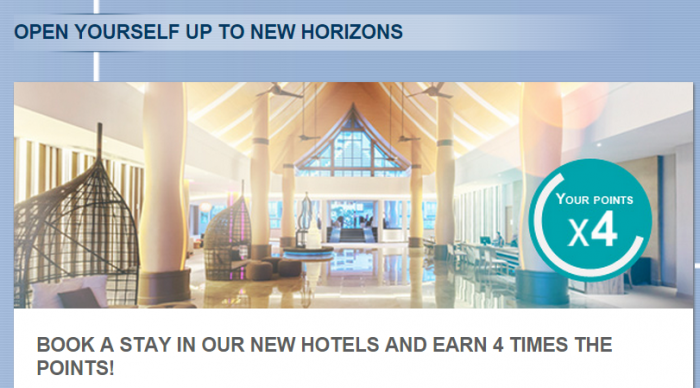 Le Club Accorhotels has just released a list of select new hotels where Le Club Accorhotels members can earn quadruple (4X) points. The valid stay dates are June 5 to August 31, 2015, for bookings made between June 5 to July 20. The Accor seems to have extended both the booking and stay windows for the new hotel promotion by a month. May be this indicates that there is no such a new list next month? This is a good way to earn more points if you happen to be near any of these newly opened hotels. 2. This offer is valid for a stay from 01/06/15 to 31/08/15 in one of the participating hotels (9720, 9779, 9890, 9131, 9801, 9969, 9970, 9971, 9190, 9394, A018, 9266, 9724, 8475, 9309, 8283, 9880), and booked between 01/06/15 and 20/07/15.